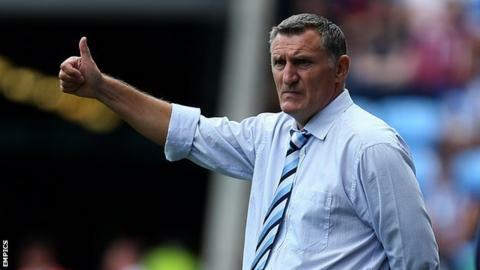 League One leaders Coventry City will continue to be brave and attack teams as they aim to maintain their excellent start, says manager Tony Mowbray. The Sky Blues preserved their 100% record with a 3-2 win over Crewe Alexandra on Tuesday. "We've got to try to win games by scoring goals and attacking," Mowbray told BBC Coventry and Warwickshire. "At the moment, while the pitches and the weather are good, we can play to the strengths of the team." After John Fleck's opener, a fifth of the campaign from Adam Armstrong and a late winner from Jim O'Brien helped Coventry see off the Alex at home for the first time in 10 years. "I had spoken to a few people who thought this would be a big banana skin for us because we don't seem to be able to beat Crewe - and I can see why, they are a good expansive team," Mowbray said. The last time Coventry won their first three league games was in the inaugural season of the Premier League in 1992-93. Back then, they beat Middlesbrough at home 2-1, won 2-0 at Tottenham and saw off Wimbledon 2-1 at Selhurst Park. "We had 27 shots on goal, so that's not a bad ratio." Despite their success so far, Mowbray is keen for his side to tighten things up at the back, after losing the lead twice to the Railwaymen. "That's the frustrating part and hopefully it's not a common theme but we were a bit naive," he added. "Sometimes you have to be brave to win matches and you leave yourself exposed but we've got the points in the bag."